There are several endowments which fund particular teaching positions or provide for research, conferences, lectures, and the support of various subjects. The Alumni Chair for Dogmatic Theology provides income to fund, in part, course offerings in Dogmatics. 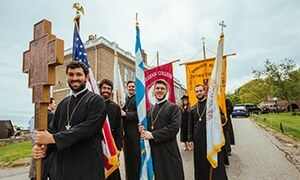 The Archbishop Demetrios Chair of Biblical Studies and Christian Origins, funded by the Jaharis Family Foundation in honor of His Eminence Archbishop Demetrios, Geron of America, provides resources for the teaching of biblical studies and the promotion of research and scholarship in this field. The chair is presently held by Rev. Dr. Eugen J. Pentiuc. The Archbishop Iakovos Professor of Orthodox Theology Endowment funds the salary of the Archbishop Iakovos Professor of Orthodox Theology. This position is presently held by the Rev. Dr. Emmanuel Clapsis. The Michael G. and Anastasia Cantonis Chair of Byzantine Studies funds lectures, research, publications and other activities as well as a chair in Byzantine studies. The chair is presently held by Dr. James Skedros. The Achillea and Anastasia Thomas Styliades Pastoral Theology and Care chair provides support for focused attention in the instruction of future priests and lay Church leaders in Orthodox Pastoral Theology, formation and care. The chair is presently held by Dr. Phillip Mamalakis.